Congenital diaphragmatic hernia (CDH) is a defect in an unborn baby’s diaphragm, the muscle that divides the chest cavity and abdominal cavity. CDH occurs when the diaphragm does not close the right way during the baby’s development and abdominal organs push (“herniate”) through the defect into the chest cavity. This can occur on the left or right side, but left is more common. The organs that come up into the chest can press on the lungs and can result in a condition in which the lungs remain small and underdeveloped, also called pulmonary hypoplasia. 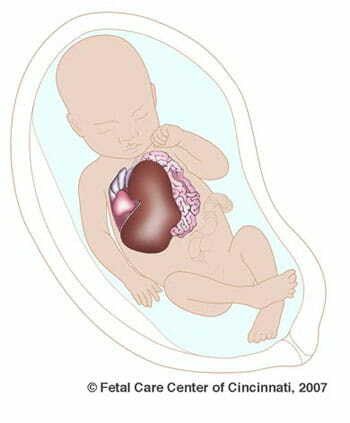 Some babies with CDH also develop conditions affecting their heart, liver, intestines and nervous system development. CDH is not usually inherited, and its cause is not known. CDH occurs in about one in 2,200 live births and is usually seen during a routine prenatal ultrasound in the first or second trimester. Congenital diaphragmatic hernias can range from mild to severe. In the best cases, infants do very well with routine prenatal and neonatal care, and may not need emergency surgery after birth. Lungs in these babies with a mild form of CDH will still be smaller than normal, but they have the chance to grow and adapt for many years. Many of these children can lead normal, active lives without long-term problems. Babies with severe CDH will struggle after birth. Some will not survive. Others are saved through intensive medical care. However, these babies often have long-term health issues with breathing, feeding, growth, hearing and development. Ultrasound to study the entire chest and abdomen to look for very subtle signs of CDH that help to predict the severity of lung problems that go along with CDH. Fetal MRI to help look more closely at the baby’s condition and rule out other problems the baby could have due to CDH. Fetal echocardiography, a high-tech ultrasound of the baby’s heart, to see if the baby has a heart defect, which can happen along with CDH. Genetic studies to look at the chromosomes or other genetic material that make up the baby to see if there are changes that could have caused CDH. We encourage referring physicians to participate in the team meeting via video conferencing and contribute their insights to their patient’s care. Babies born with congenital diaphragmatic hernia are at high risk of having severe breathing problems since their lungs have not developed properly. Managing these problems is the first and most important step in caring for babies with CDH after birth. Some of these babies are placed on a ventilator (breathing machine), but those with very severe breathing problems will need ECMO (extracorporeal membrane oxygenation), a type of heart-lung bypass machine. ECMO bypasses the narrow blood vessels in the baby’s lungs (due to the pulmonary hypoplasia), giving the lungs and blood vessels the chance to rest and develop. When a baby has severe CDH, our team may recommend a special birth plan involving EXIT-to-ECMO (ex utero intrapartum treatment-to-extracorporeal membrane oxygenation). EXIT-to-ECMO is a different type of cesarean delivery in which the baby is more slowly removed from the womb and immediately placed on ECMO. This technique allows the baby to have a steady supply of oxygen throughout the birth process and lets the medical team look more closely at the baby to see how severe the baby’s condition is. It also gives time to determine whether emergency surgery is needed to repair the CDH. EXIT-to-ECMO is thought to improve survival for babies with the most severe cases of CDH. Cincinnati Fetal Center is one of only a few institutions in the United States offering EXIT-to-ECMO for patients with severe CDH. EXIT-to-ECMO is thought to improve survival to 65 percent for this very high-risk group of patients. Without it, the survival rate is usually 11 percent to 40 percent. Some babies with congenital diaphragmatic hernia do not require surgery after birth to repair the defect. Many, however, do. The surgery takes place days or weeks after birth, once the baby’s condition has become more stable. During surgery, the surgeon places the abdominal organs in their proper position and repairs the opening in the diaphragm. Afterward, the baby is placed on ECMO, giving the lungs a chance to recover and expand. Some babies with severe CDH experience neurologic problems, muscle and skeleton conditions, airway disease, stomach acid coming up into the esophagus, hearing loss, seizures, developmental delays, and other problems. The long-term outcome of infants with CDH depends on how severe is the underlying underdevelopment of the lungs, the severity of blood vessel narrowing to the lungs (called pulmonary hypertension) and the degree of chronic lung disease from having long-term breathing support. Specialists at Cincinnati Children’s have vast experience in treating these underlying conditions. They look for these complications and provide early treatment when possible. They also provide long-term follow-up programs focused on helping these children very early on to reach their full potential. The Cincinnati Fetal Center is one of the country’s only hospitals with a dedicated team of CDH specialists. This group of highly skilled physicians directs all aspects of care, from prenatal diagnosis through long-term follow-up. Our team is always caring for babies with congenital diaphragmatic hernia in our hospital. Having these special babies to take care of all of the time gives us broad experience with their very special needs. Combining our bedside care of these babies with severe CDH with our clinical and basic science research to improve CDH care enables our team to provide the most advanced, effective therapies available. Consistency. The same team of physicians cares for patients from diagnosis through long-term follow up. Collaboration. Physicians from many specialties share their expertise to ensure that each aspect of a child’s care is taken care of. Sophisticated treatment options. Our experience with CDH and commitment to research means that we can provide the most useful treatments available. Family-centered care. We encourage parents to be a part in every aspect of their child’s care, and we value their input. The Cincinnati Fetal Center team works closely with referring obstetricians and maternal-fetal medicine specialists to facilitate prenatal management, and with pediatricians who will provide primary care once the baby has been discharged home. The Cincinnati Fetal Center has performed 279 prenatal evaluations for CDH since 2004. Learn more about the FETO treatment for CDH.